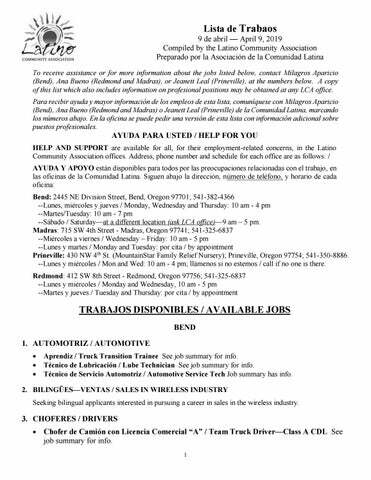 Lista de Trabaos 9 de abril — April 9, 2019 Compiled by the Latino Community Association Preparado por la Asociación de la Comunidad Latina To receive assistance or for more information about the jobs listed below, contact Milagros Aparicio (Bend), Ana Bueno (Redmond and Madras), or Jeanett Leal (Prineville), at the numbers below. A copy of this list which also includes information on profesional positions may be obtained at any LCA office. Para recibir ayuda y mayor información de los empleos de esta lista, comuníquese con Milagros Aparicio (Bend), Ana Bueno (Redmond and Madras) o Jeanett Leal (Prineville) de la Comunidad Latina, marcando los números abajo. En la oficina se puede pedir una versión de esta lista con información adicional sobre puestos profesionales. Aprendiz / Truck Transition Trainee See job summary for info. Técnico de Lubricación / Lube Technician See job summary for info. Técnico de Servicio Automotriz / Automotive Service Tech Job summary has info. 2. BILINGÜES—VENTAS / SALES IN WIRELESS INDUSTRY Seeking bilingual applicants interested in pursuing a career in sales in the wireless industry. • Chofer de Camión / Transfer Truck Driver $20/other, DOE; 40 hrs. Need 1 yr experience. • Choferes de Entregas / Parts Delivery (2) See job summaries for more info. 4. CHOFER DE AUTOBUS / BUS DRIVER Part-time; need CDL & School Driver’s endorsement (training provided for someone making full year commitment). 5. ENTREGAS / DELIVERIES Earn <$18/hour as a “Dasher”, including tips, with tech company connecting customers with local businesses. They order meals, etc. from local merchants; Dashers deliver it to their doors. May qualify to get paid daily. Need to be 18+ yrs old, have car, iPhone or Android smartphone, valid Driver’s license/insurance, clean driving record. PT or FT; set your own schedule; wherever you want. 6. ENTREGAS DE CONCRETO—HORARIO Y DESPACHO DE / CONCRETE SCHEDULER & DISPATCHER FT, with excellent benefits. Also seeking to fill several other positions in Bend. 7. FERIAS DE TRABAJO / JOB FAIRS • Thurs., 4/11, 1-4pm. Multiple employers from a variety of fields offer many position options. Free. • May 6, 4-7pm, to fill seasonal positions for resort departments this summer, in: banquets, bell services, culinary, food and beverage, guest services, golf, housekeeping, marina, reservations, Sage Springs Club & spa and utilities departments. Mantenimiento / Facilities Maintenance Tech See job summary for info. Pintores / Painters $14-$22/hr, DOE; 40 hrs. • Negocio de Importación / Import Company seeks a few employees, FT only, 7-4 shift, $11/hr. For Dutch American Import Co. (FYI, women preferred; don’t think it’s legal to mention this). • Trabajador / General Laborer, 1-2 yrs exp., FT. MADRAS 11. CAPACITACIÓN / TRAINING PROGRAM FOR THOSE 55 AND OVER $10.50/hr., 24 hrs. (Senior Community Service Employment Program—SCSEP) 12. COCINERO / RESTAURANT COOK $$ DOE, 40 hrs; busy restaurant. 13. AUTOMOTRIZ Y CHOFERES / AUTOMOTIVE AND DRIVERS • Automotriz / Service Technician $20-$30, DOE; 40 hrs, 1 yr exp. • Automotriz / Diesel Technicians—Mechanics $20-$25/hr., DOE, 40 hrs., 1 mo. experience. • Choferes con Licencia Comercial / CDL Drivers $14/hr, DOE (+); 40 hrs, 6 mo. exp. 14. LIMPIEZA--MANTENIMIENTO / CLEANING—CUSTODIAL--maintenance • Limpieza / Housekeeper—Custodian $14.50-$15/hr; 40 hrs., 2 yrs experience • Mantenimiento / Maintenance #13.77/hr, 40 hrs; 1 yr experience 15. OTROS TRABAJOS DISPONIBLES EN MADRAS / JOBS AVAILABLE IN MADRAS Jobs requiring various skills and/or skill levels. 16. PRODUCCIÓN / PRODUCTION WORKER $12/HR, DOE, 40 hr; 6 mo. experience. 17. VENTAS / THRIFT STORE ASSOCIATE $13.50-$14/hr, 15 hrs; 2 yrs exp. LA PINE AND SUNRIVER 18. LUGAR DE RECREACIÓN--FERIAS DE TRABAJO / RESORT-RELATED HIRING FAIRS / To fill resort-related seasonal positions for the following resort departments this summer: banquets, bell services, culinary, food and beverage, guest services, golf, housekeeping, marina, reservations, Sage Springs Club & spa and utilities departments. Fairs are scheduled for: (1) April 27, 12-3pm, in La Pine; (2) May 6, 4-7pm in Bend (see Bend listings); and (3) on May 28, 4-7pm, in Sunriver. PRINEVILLE 19. COCINERO / COOK $10.50/HR., 20 HRS; no experience needed. 20. MOLINERO / MILL WORK $12.50/hr., 40 hrs; no experience needed. 21. SEGURIDAD PARA CENTRO DE DISTRIBUCIÓN DE LLANTAS / SECURITY FOR TIRE DISTRIBUTION CENTER See job summary for info. 22. TRABAJADOR / GENERAL LABOR $14/hr, 40 hrs; no experience needed. positions): Aerie Café: Night Cook PT (2); Lodge Housekeeping: Lodge House Person PT (4); and Rental Management: Maintenance Technician FT (1). Chofer de Entregas / Delivery Rep Driver, CDL—Bulk No experience needed. Chofer de Entregas / Deliveries Driver See job summary for info. Chofer de Entregas / Parts Delivery See job summary for info. Chofer de Entregas / Local Delivery Driver $14/hr, 40 hrs, no exp needed. Cocinero(a) de Línea / Line Cook $10.75-$14/hr., 30 hrs; 2 yrs exp. Limpieza / Housekeeper Full time, seasonal. Técnico de Servicios y Reparaciones / Facilities Tech—Repair Person $15-$24/hr., 40 hrs; 1 yr exp. Mantenimiento-Pintor / Maintenance-Janitorial-Painter Pay DOE, 20 hrs; 6 mo exp. • Ensamblador / Wax Assembler $$ DOE, 40 hrs. No experience needed. Trabajador / General Laborer, 1-2 yrs exp., FT. Customer Assistance Seasonal PT, exp. 5-20 yrs. Inside Sales Associate FT, uncapped comm; work from home! 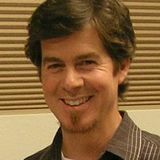 6-20 yrs. exp. QMHA-Oregon FT, 0.9 NOC Thurs; 3 yrs exp needed. Service Agent Car Detailer Seasonal, PT, exp. “open”. FT, uncapped comm; work from home! 6-20 yrs. exp. Inside Sales Associate FT, uncapped comm; work from home! 6-20 yrs. exp.